Four brothers living on the edge of society…scandalizing the ton at every turn! Another Warriner brother to love! 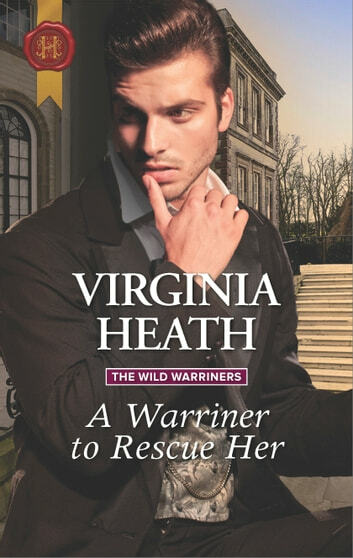 Oh my another fabulous story from author Virginia Heath and another Warriner brother to love! This is the second book in The Wild Warriners series and is based on Captain James Warriner. Jamie has returned from the war a broken man, physically and mentally. He has trouble sleeping and limps from a gunshot wound. His insecurities are at an all time low and feels no woman would want him broken as he is. Cassandra (Cassie) Reeves is the only daughter of the newly appointed vicar, who happens to be a mean and vindictive man and a horrible father. Cassie has a bubbly, talkative personality or at least that's what we see on the outside. Within she is very insecure and doesn't believe herself good enough or pretty enough for the handsome Captain Warriner. If ever two people deserved a happy ending it has to be Jamie and Cassie! What a fabulous couple that I instantly fell in love with. Two broken and insecure people who end up healing each other with their love for each other. Another perfect story from the pen of author Virginia Heath! I am absolutely loving these Warriner brothers and the lovely ladies they have fallen in love with! Virginia Heath will leave me speechless! Amazing! I had written that the previous book, A Warriner to Protect Her, was supercalifragilisticexpialidocious, how could A WARRINER TO RESCUE HER compete? Am I allowed to use the same superlative? It is as spectacular! Cassandra “Cassie” Reeves is stuck in a tree while fetching apples for her pony Orange Blossom. Captain James Warriner hears her cries of distress. He rescues her in what is one of the most funny, sensual and delightful opening scenes I have ever read, and it only goes uphill from there! Jamie is an extraordinary character. A war veteran, he suffers acutely from the horrors he has experienced; one of his legs his badly damaged, he feels useless on the family farm; Jamie has despaired of ever finding love and having a normal life. Who would want such a broken man? He is handsome, strong as an ox, and also has a particular way of coping with his empty life. Cassie, she of the drab dresses and the naughty garters, is just as splendid a character. She has a sunny disposition, as opposed to Jamie who never manages to say what he means properly and lives in the dark of his mind. Cassie seems happy, but appearances are deceiving, as her father Reverend Reeves dictates almost every breath she takes. But she has a secret, well hidden from her bombastic, hypocritical, small-minded, and destructive father. Both Jamie and Cassie are artists, I will not say more, but Virginia Heath’s eloquence knows no bounds as she describes paintings so vividly that I could see every colour and detail in my mind’s eye; incredible! Jamie and Cassie recognise each other as kindred souls, they understand each other, they help and comfort each other as best they can; they would love each other if only they could. I swear I was reading with my mouth open, I read way past my bedtime; I was utterly mesmerised. A WARRINER TO RESCUE HER is happy, whimsical, terrifying, horrifying, uplifting, and the romance is so delicate yet so powerful. Jamie and Cassie are extraordinary characters, entirely different in their behaviour, and yet so alike in many ways. It’s honestly impossible to convey how I felt reading this book; it is magic put into words. Reverend Reeves is so believable, I could picture him lecturing and spewing his hatred; he made my skin crawl; he is evil, and yet so real, it’s truly frightening. Virginia Heath is a rare talent; her prose is phenomenal, beyond gorgeous; her vocabulary is stunning; the dialogues feel so genuine, I literally heard Cassie’s voice while reading, and her way with characters is unique: they are of such complexity, that they feel real. I honestly cannot find the words to convey how captivating, dazzling, astonishing A WARRINER TO RESCUE HER is; it has to be read to be believed. THE WILD WARRINERS is well on its way of becoming my favourite historical series of all time. I voluntarily reviewed an advanced reader copy of this book.